2. 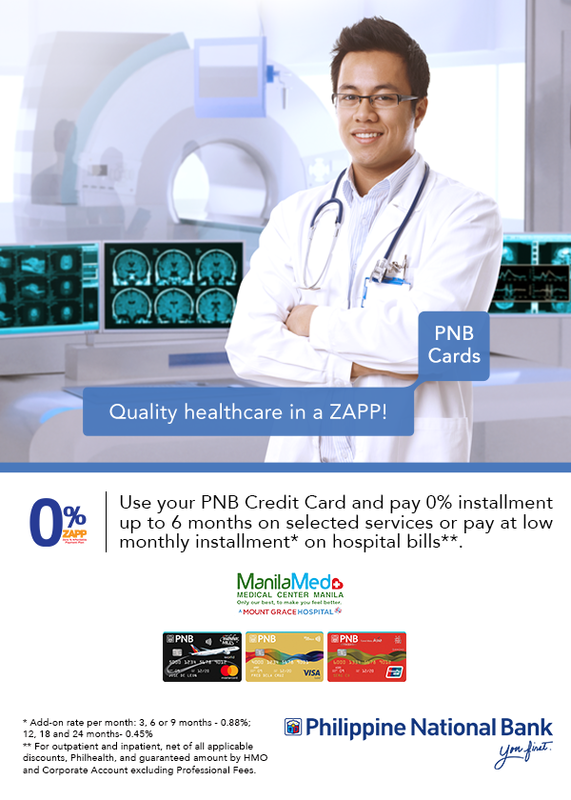 For other hospital services (excluding MedExpress and Professional/Reader’s Fee), you can pay special low monthly add-on rate. 1. Offer is open to all active principal and supplementary PNB issued credit cards in good credit standing except Corporate and Distribution Cards. 2. Minimum amount for installment is P3,000, net of applicable discounts and deductions. Applicable “discounts” shall mean Mandatory Discount like Senior Citizen, Person with Disability, and Institutional (Medical Staff, Employee, Stockholder, Special Corporate, etc.). Applicable “deductions” shall mean Guaranteed Amount by Philhealth / PCSO / DSWD / HMO / Insurance / Corporate / Stockholder / Medical Staff / Employee. 3. All ZAPP transaction is subject to bank approval and valid if the total amount due is paid in full. 4. The monthly installment amount shall be posted as a regular transaction on the credit card account and shall form part of the total amount due. Should the cardholder choose to pay only a portion of the total amount due, but not less than the minimum amount due, the monthly installment shall be subject to the regular finance charges. 5. Cardholder may request to charge the full amount of the remaining unpaid principal amount subject to PNB’s approval. A processing fee of 5% of the total unpaid principal balance or Php500, whichever is higher, shall be charged to the cardholder’s account. The unpaid principal amount plus the applicable fees will form part of the outstanding balance and subject to monthly finance charge. 6. All ZAPP transactions posted in the Cardholder’s account shall earn rewards points or miles. Rewards points or miles will be reflected in the SOA upon posting of the monthly amortization. 7. Failure to pay any two (2) consecutive minimum amount dues shall constitute default and the total outstanding balance shall immediately become due and demandable. 8. Cardholder acknowledges his/her liability to PNB for the installment purchases and will form part of the cardholder’s obligation to PNB. 9. The Terms and Conditions governing issuance and use of PNB credit cards are incorporated herein by reference and made integral part hereof.